In the last while I have had 3 sessions with different audiences, all interested (if not necessarily committed) to laboratory quality management. As much as we have made huge progress, it seems to me that we still have a long way to go. As a group, these laboratorians have reached the step of vocabulary recognition. They know the terms “Quality Indicators” and “Gap Analysis” and ISO15189, but putting these into an operational context is still missing. 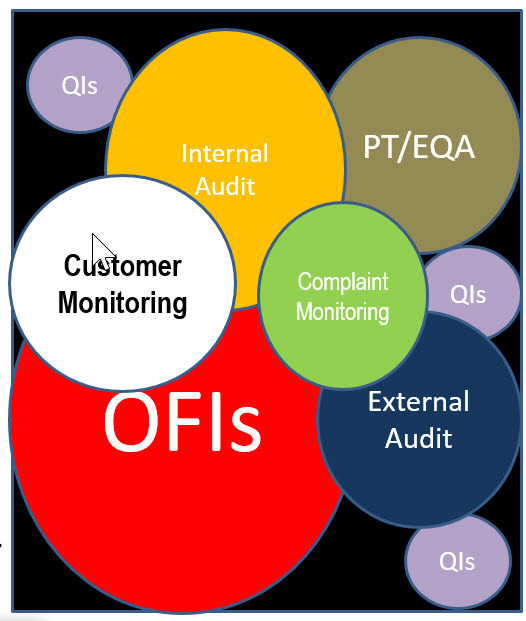 What stands out more than anything else is the understanding that when it comes to Quality Management and improvement activities it is NOT a one-and-done process, and equally important, almost all are missing the driving force “if not you, who?”. Interest without commitment does not make for quality improvement. What laboratorians must grasp as critical understanding that if Quality is going to improve it will have to involve their own personal and ACTIVE engagement on a regular and on-going basis. There is an appreciation that putting in Quality Indicators is a good thing to do, but what is missing is that while Quality Indicators can be a useful measurement tool to address point specific concerns, the average laboratory has dozens (if not hundreds) of point specific concerns. There is a full array of Quality Tools that should (must) be used to get a good overall picture of how well (or unwell) the laboratory’s quality efforts are working. I think of them as the Essential Eight, and I argue strongly that (a) every laboratorian needs to be aware of each of these techniques and (b) each laboratorian should get their hands dirty by participating in implementing each of these techniques early-on. And laboratories have to develop and hone their Quality routine so that their Essential Eight activity is both Early and Often. A quick look at the Essential Eight might suggest they are divided into 2 groups, those for which the laboratory is responsible, and the others which are effected by others. But coming to that conclusion would be wrong. The laboratory has to take an active position in rolling out Proficiency Testing (EQA), making sure that every person at one time or another is involved and the challenges are tested using the laboratory’s normal and standard procedures, and that the reported results reflect how the laboratory would normal report. And if the laboratory takes on a passive role of awaiting to be contacted by an Accreditation Body to prepare for an upcoming external audit, it is almost a guaranteed outcome that the preparation will be at best superficial and transient. Every laboratory should be actively filling the time between accreditation external audit visits by doing their own internal audits either as a full audit or as a series of mini targeted audits. Either approach can be effective and depends upon the size of the laboratory and the degree of change and innovation that is going on in the laboratory. And if you feel that doing your own internal audit creates a risk for personal bias, then consider inviting someone (either a consultant, or a colleague) to come in and do an audit for you. We call that an external-internal audit. Of the remaining essentials, without doubt the single most important essential is the setting up of an active Opportunity for Improvement (OFI) list that is honest and open and complete. If the laboratory is not prepared to record their errors and mistakes, there will NEVER be any recognition, NEVER be any examination, and NEVER be any corrective action. We can say with ABSOLUTE CERTAINTY, that in the absence of an OFI list the laboratory is doomed to repeated errors and never achieving any evidence for improvement. Quality Control as a monitor for quality is a given. If a laboratory is not doing quality control, then it is difficult to think of it as a laboratory, and will undoubtedly be closed down by accreditation or lawyers, whichever comes first. I have mentioned before the importance of recognizing the importance of customer needs [see: http://www.medicallaboratoryquality.com/2016/10/conference-report-laboratory-and.html ]. Waiting for complaints to come in is the way we used to deal with customer service, but that was a long time ago. Actively seeking customer input and opinion is the only way to know if your efforts to improve are being noted and serving customer needs. Without expounding on the other activities, let me point out opportunities to improve are all over the spectrum, and if your laboratory is not looking everywhere, many problems will be missed, until it is too late. 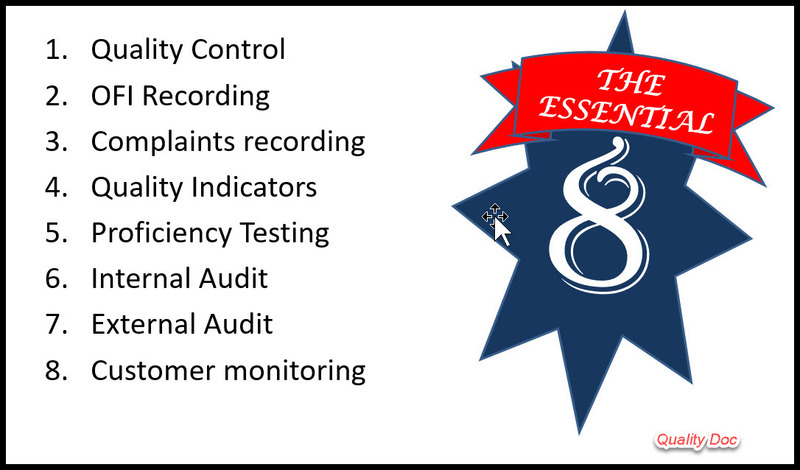 By using all of the power of the Essential Eight, you increase your likelihood of success. Put another way, there is an association between implementing Quality Improvement and playing Golf. In theory, one can play a round of golf only using a seven iron and if you are patient and lucky you might succeed. if you goal is to capture as many of your error opportunities as possible you will be far more successful of you take advantage of all your 14 clubs (or in this case 8! ), each in its own appropriate way and place. And Quality Gaps are BAD THINGS.